I can’t believe that just last week we were in London! Time certainly has flown by! One day while my husband was working, I strolled over to Hyde Park to explore the Christmas Market as part of the Winter Wonderland. I was envisioning rustic Christmas stalls filled with handmade goodies not a park full of glitzy carnival rides for children. Winter Wonderland at Hyde Park in London. I finally found the Angel’s Market which is home to about 100 wooden stalls selling everything from Christmas decorations to homemade candies to leather wallets and Turkish lamps. (I seem to find a Turkish store wherever I go!) The market is open daily, except Christmas Day, through January 5. The Winter Wonderland entrance near the Hyde Park Corner tube station. And you can't leave a Christmas market without buying a Turkish lamp! Lots of food and drink options at least! 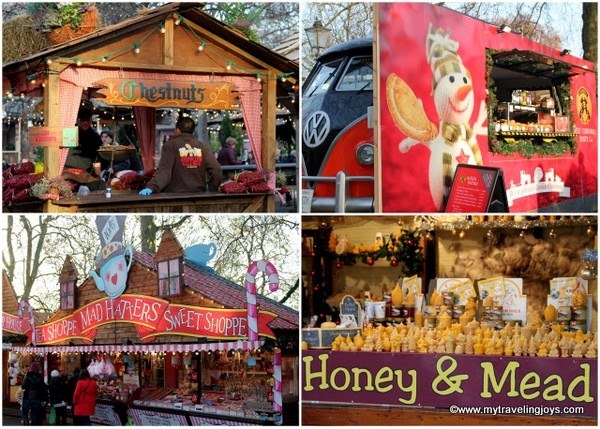 Of course, you'll find several stalls selling mulled wine and hot chocolate too! You can avoid the carnival ride section by taking the London tube to the Hyde Park Corner exit and following the signs to Winter Wonderland. I discovered that little tidbit after I walked through everything. Oh well! The market is a little over the top, and I didn’t find as many authentic-looking, handmade Christmas decorations as I had hoped. I did buy two wooden decorations made from Black Forest wood in Germany. Guess next year, we need to visit one of the real Christmas markets in Germany! I concluded my market visit in London by eating a grilled German bratwurst and drinking a pint of Weiss beer. A Christmas market doesn’t get any more authentic that, right? There's even an ice skating rink at Hyde Park. And if you wander off to the side of the market, you'll find a pond with these white geese in Hyde Park. @Julia, well I've connected through Heathrow a dozen times and first visit was just 2011. London is a geeat city, but unfortunately, very, very expensive! ! Apparently in Germany there is a movement against all the extra fair-type of entertainment - but I suppose these exist because the regular Christmas type stalls just don't bring in enough money. But lucky you! I have never been to a London Christmas market!!! i would love to go to that market and eat some currywurst! You've spent more time in London that I have in the past couple of years. The last time I went Christmas shopping in the Capital, there was the wrong kind of snow on the line and I spent most of my time shivering on a station platform. Plus, you got to enjoy the unseasonably nice weather we seemed to be having in London last week. This week, back to the rain! @joyce, there definitely was currywurst! @Annie, well the market was alright, but I cannot imagine shopping for too much in London because the city is sooo expensive! @Kasia, how ironic! I just moved from Istanbul to Warsaw in April. Thanks for the Zakopane tip! We plan to visit Krakow next weekend! Sounds like you had a great day out!! Exploring winter in Europe is incredibly romantic; the beautiful cities and majestic architecture are truly inspiring in the season of good will. Taking a river cruise in winter is ideal for celebrating the festive period and here are just a few of the cruise options you have during that time.